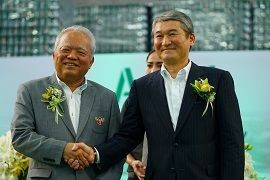 TOKYO, Dec, 07 2018 - (JCN Newswire) - Showa Denko (SDK; TSE:4004), Showa Aluminum Can Corporation (SAC), a consolidated subsidiary of SDK, and Carabao Group PCL (CBG), a leading beverage maker headquartered in Bangkok, jointly held a ceremony on December 6 for the completion of a new aluminum can factory owned and operated by Asia Can Manufacturing Co., Ltd. (ACM). 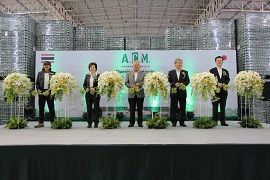 ACM is a can manufacturing company established in June 2017 as a joint venture among SDK, SAC and CBG, and had been conducting the project to construct the new factory since then. The Showa Denko Group positions its aluminum can business as "Growth-accelerating" business in its ongoing medium-term business plan "Project 2020+," and has been promoting business expansion strategy targeted at Southeast Asia. As a result of the completion of the new aluminum can factory of ACM, Showa Denko Group's capacity to manufacture aluminum cans in Southeast Asia has been expanded to 3 billion cans a year, including that of Hanacans Joint Stock Company of Vietnam. 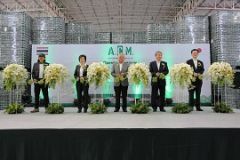 After the start-up of operations of the new factory, ACM will mainly manufacture aluminum cans for CBG's beverages for export from Thailand. CBG aims to expand its overseas sales, centering on Southeast Asian countries, China and the United Kingdom. ACM will support CBG's overseas operations through stable supply of high-quality aluminum cans manufactured by leading-edge technologies and quality management system built up by SAC over many years. Company name: Asia Can Manufacturing Co., Ltd.
Showa Denko K.K. Public Relations Office, Tel: +81-3-5470-3235.